Satiate your hunger: Fight cravings and support healthy digestion with this delicious snack that’s packed full of both soluble and insoluble fibre. Treat yourself to Isagenix FibreSnacks and indulge in the taste of rich chocolate and crunchy peanuts without feeling guilty about breaking your diet. This snack gives you 20% of your recommended daily intake of fibre, aiding in digestion, and also contains whey protein to help you feel full for longer. Designed to help you to improve your digestive health and meet your weight loss goals, containing no trans-fats and just 150 calories per bar. Both soluble and insoluble fibre support the growth of healthy gut microflora while also curbing hunger between meals. Fibre helps to slow the absorption of carbohydrates, so you don’t experience blood sugar spikes that can lead to cravings and encourage overeating. Protein also helps you to feel fuller for longer. This product includes 6 grams of undenatured whey protein per bar to help satisfy your hunger and keep your muscles strong even as you lose weight. Anytime you’re feeling peckish, FibreSnacks make a convenient and nutritious treat that you can enjoy completely guilt-free. FibreSnacks contain 6 grams of both soluble and insoluble fibre per bar, giving you 20% of your recommended daily intake. Prebiotic soluble fibre helps to improve digestion and enhance immune functioning by supporting healthy intestinal flora. Get a healthy dose of protein to keep you going between meals with FibreSnacks bars. Healthy, undenatured whey proteins help you to stick to your diet during the day by satisfying your hunger and discouraging overeating. Adequate protein is also important when building or maintaining muscle mass. 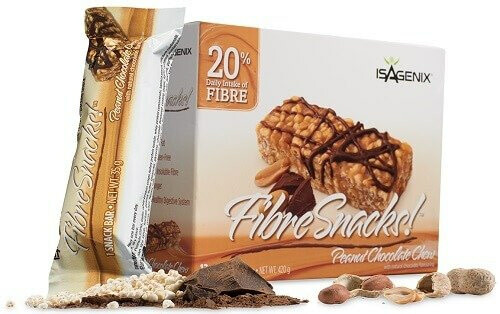 Like many Isagenix products, FibreSnacks are completely gluten-free. They are also safe for anyone who keeps follows a kosher diet. FibreSnacks include certain essential vitamins and minerals that help to keep your body fit and healthy. Potassium promotes heart health, while calcium helps build strong bones and regulate muscle movement. Iron plays an important role in the transportation of oxygen through the bloodstream, helping to keep your entire body in working order. Why do I need fibre in my diet? Fibre is important when it comes to proper digestive functioning. Both soluble and insoluble fibre help to maintain gut microflora and prevent heart disease, weight gain, and the onset of diabetes. 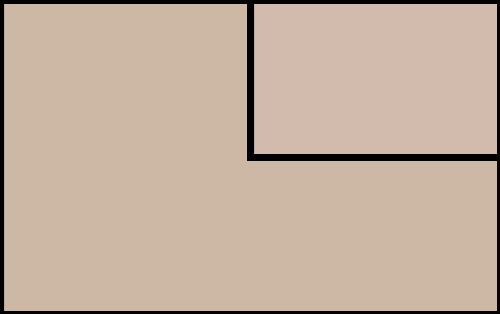 How much fibre do I need each day? Many adults don’t get the fibre that they need each day to stay healthy. In Australia it is recommended that women consume at least 25 grams per day and men 30 grams per day. FibreSnacks make a great treat for when you’re feeling hungry between meals. As part of a balanced diet, they provide protein and fibre that helps you to avoid snacking too much throughout the day by keeping you feeling full. Enjoy a healthy alternative to sugary snacks such as candy bars, but they shouldn’t be considered a meal replacement. Decadent peanut chocolate chew flavor. Order now to support your digestive health and keep those pesky cravings at bay throughout the day!